Product prices and availability are accurate as of 2019-04-24 10:50:58 EDT and are subject to change. Any price and availability information displayed on http://www.amazon.com/ at the time of purchase will apply to the purchase of this product. 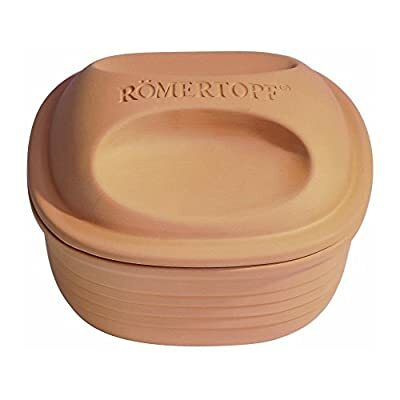 The Reston Lloyd Romertopf Square Side Dish is a multi-functional clay baker designed to create healthy, more flavorful side dishes for two to four people. With its easy-clean glazed bottom and unglazed top, this German-designed earthenware dish seals in moisture and nutrients for meals that are both tasty and easy to make. Reston Lloyd's product line includes accessories that complement and further extend the products of companies such as Pfaltzgraff, Corning, and Disney. Since company president Rita Bolle held the first department store Clay cooking demonstration in 1968, Reston Lloyd had developed and flourished as an industry standard. Square-shaped clay baker with 2-quart capacity. Outstanding quality of German traditional ceramics. Makes healthy side dishes for 2 to 4 people. Unglazed top helps create moist, tender foods. Dimensions: 9 diam. x 6.5H in..
Square-shaped clay baker with 2-quart capacity Outstanding quality of German traditional ceramics Makes healthy side dishes for 2 to 4 people Unglazed top helps create moist, tender foods Dimensions: 9 diam. x 6.5H in.